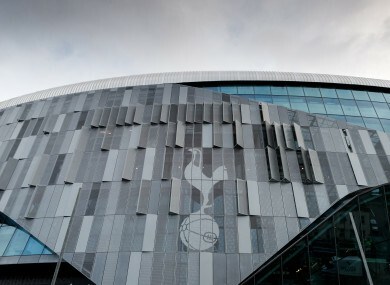 Tottenham Hotspur's new White Hart Lane stadium in London. THE TOTTENHAM HOTSPUR fan who threw a banana skin onto the pitch at the Emirates Stadium as Arsenal forward Pierre-Emerick Aubameyang celebrated scoring a penalty in front of Tottenham fans will not be charged with a racist offence. Averof Panteli — a 57-year-old grandfather — will face a charge of throwing a missile after police judged it not to be a racially aggravated offence. Panteli — who says he will plead guilty to the charge when he is in court on 18 December — has also been informed by Tottenham he will be banned from their games for life. “The police were happy to say it was not racism,” he told The Sun. Panteli, who says his only previous brush with the authorities was when he ran onto the Spurs pitch aged 14 and was ejected from the stadium, said he had been irked by Aubameyang celebrating in front of the Tottenham fans. The Gabonese star’s spot-kick gave Arsenal an early lead and the Gunners eventually ran out 4-2 winners. “I am not racist whatsoever,” said Panteli. I am actually a Greek Cypriot. I am 100% not a racist. I swear on my kids’ lives that I am not that kind of guy. “The Arsenal player was gloating in front of the away fans. He came up towards the away fans about 10 metres away and he is basically nodding his head and clapping at us. “Without thinking, I picked up this banana skin from the ground and threw it on the edge of the pitch. “I didn’t throw it at the players. It was just on the edge of the pitch. Email “Banana-throwing Spurs fan will not face racism charge”. Feedback on “Banana-throwing Spurs fan will not face racism charge”.